León Guanajuato, August, Month 1: Multiple Cities – Caitlin Frances Bruce, PhD. This marks a little over a month since I have arrived in León. Though I have visited five other times, living here for an extended period is much different. You get a sense of the daily rhythms of neighborhoods, of the larger cultural calendar of the city, the impact of the seasons and more durational conversations or worries be they related to environment, security, or politics. My aperture on these cycles is particular, of course. As a tall foreigner, with light skin and very curly reddish blonde hair, I stick out and I have particular kinds of mobility and privilege. I live in a central area, so my understanding of the temporality and spatiality of the everyday is one that is heavily inflected by tourism and historic preservation imperatives. There are far more bars than ferreterias in my immediate surrounds. My cultural landscape is often monumental, with the Arco de Calzada framing my entry into ordinary errands. And yet, it would be inaccurate to state that this more heavily touristic region is without texture. The Arch and the Paseo de Niños Heroes serves as a bike and running path, a site for dog walks, a shady bench for lovers to meet, a distribution point for evangalists, a commercial site for rotating markets, an educational site for entrepreneurship and job fairs, a stage for break dancing competitions, a resting place for mariachis during their lunch break outside of the Museo del Toro. The plaza of Templo Expiatorio, too, might seem to promote with its baby blue and pink icing exterior that resembles but does not repeat Notre Dame a certain Disneyfied landscape, one that is divorced from the grit and grind of everyday working life. But this space, too, serves as a reunion point for indigenous textile and fruit vendors, sellers of postres in little mobile refrigerators, smoked nuts in vast baskets, and alms beggars who line the entryways to the massive temple. Families stream in and out of the church in Sunday elegance: towering stilettos and shimmering suits, but so too do dancers clad in white and flowing fringed indigenous costumes who dance in the plaza adjacent to the church, embodying the cultural syncretism that defines but does not fix Mexican public culture. The larger plaza is the stage for various festivals: Blues, Electronic, Wednesday public dances where a band plays and couples ranging from their twenties to their seventies move and embrace in the shadow of the church. More itinerant reunions occur on the stones of the plaza where punks and rastafarians gather to gossip and share news. They extend out along the central street, Calle Madero, selling braided bracelets and copper jewelry. The bars open between 5pm and 6pm and the street becomes another scene for ostentatious display, younger patrons streaming in and out of bars, some out until 4am. León is a city of leather, technology, education, and business. By 1940 footwear was consolidated as the primary industry of the city (33). Héctor Gómez-Vargas argues in Cartografias Urbanas y el Equipmiento Cultural en León that León is not one but “many cities,” an urban space with multiple identities and worlds contained within it . In the early 20thcentury the majority of Mexico’s population was primarily rural. The 1950s saw changing cultural norms, as well as changes in the urban landscape including “new avenues, enlarged zones, consolidation of new social spaces for consumption through new spheres and urban environments” like community centers and “franchises (franquicias) coming from the outside, like clones and redesigned social practices of different sectors of the population” (18). The 1950s also marked a shift in the visibility and role of youth. Gómez-Vargas told me that the figure of the “rebel without a cause” became prominent during the 1950s and the government’s response was largely to create sports and work programs to try to mediate youthful energy and activity. Guillermo Adrián Tapia García further explained that this figure of the “juvenile rebelled” who is “without work, without resources, hanging out on the corner” is an ongoing concern in public discourse. The Youth Institute was founded to mediate youth violence, both symbolic and physical. Though there was a period of extreme repression of youth during Zero Tolerance “the government is not monolithic” Tapia García reflected, and there can simultaneously be “mediation, giving youth channels for expression), contraction, and control (police violence)” so there are multiple idioms for the government, that of canalización and violencia. The 1970s-1980s saw a massive rural to urban migration, which Gómez-Vargas argues is one of the most significant moments in Mexico’s history. The 1970s, then, was when the “question of urbanism is posed…in León” and city institutions like the Urban Development Department (Dirección de Desarollo Urbano) was founded, and an Urban Design Plan was published in 1978 (17). Local universities added architecture majors and began researching urban questions. This period of massive urbanization likely also implicated the physical geography of the city, creating new spaces for youth culture (car dealerships that became informal skate parks, hotels and banks that provided smooth surfaces for tags) but also the affective cartography of the city with intense anxiety about the urban “boom” and shifting cultural mores. Graffiti, my primary object of study, is part of the weave of this complex texture of León’s “many cities,” and by extension, many youth worlds. Though I’ve already heard testimony to that effect from writers like Daños, Nikkis, Kif, Wes and punk activist Toby, where they have explained that writers also are influenced by “ska, rock, punk, rasta” cultures, it is different to witness such intermingling. My second week in León I was lucky enough to attend three out of the seven days of a week-long JuventúFest, a Youth Festival organized by the city’s Insitituto Municipal de Juventud, the Municipal Youth Institute from August 7 to 13th. JuventúFest was the second iteration, though much more extensive than the prior year, and it was meant to showcase the complexity and diversity of youth culture in León, celebrating it; and also offer youth a variety of resources and lines of support courtesy of the Institute or its partners. The festival was organized into themed days: Research; Entrepreneurship; Ecology/Sustainability; Identity; Youth Explosion; Expression; Tradition. The events were a combination of expositions and performances; workshops; discussions; and inaugurations. On each day a representative from the host site and the Youth Institute would open the events, explaining the importance of the day (August 7 was International Youth Day, and August is International Youth Month), and the site (sites varied from University of Guanajuato, León, to Carcamos Park, to the Plaza of Expiatorio and Parque Niños Heroes by the Arco de Calzada, to a small rural town called Valle de Pedro Moreno). Plaza de Templo Expiatorio. August 12, 2017. Jardin Niños Heroes. Dance Competitor warming up. August 12, 2017. Breakdance competition. August 12, 2017. Thus, the festival moved between different geographic nodes in and outside of León. I may write a separate post about the festival alone, because it was complicated and rich, ethnographically, but what was most impactful for me was to learn about rhetoric of diversity of youth cultures (a claim repeated many times by Director of the Municipal Youth Institute, Ricardo Morado), and the visibility of such diversity through the different events (ecology, hip hop, African dance, salsa, rock, technology and start up culture, graffiti, indigenous history and culture, important differences between male and female gangs of youth, comics, tattoos, etc). Such interdependency between different strands of youth culture was most apparent on the last day when we took three buses up the mountain to Nuevo Valle de Pedro Moreno. This rural town had been a location for previous Youth Institute activity. A youth institute employee, Anna, explained that it is a site of baja recursos, limited resources, and they offered a variety of workshops that filled in gaps in school curriculum, things like comparative studies and literature. The Youth Institute also made some urban art interventions, painting “Animals, birds, things from the region,” graffiti writer Zhanko explained. On the bus we were a combination of writers (Zhanko and Kart), historians, and musicians and friends. And these individuals worked collaboratively to create a festival, inviting space in the central plaze of Nuevo Valle, whether it be via paintings done previously, or live music played in the moment. Nuevo Valle de Pedro Moreno. August 13, 2017. As a result of going to the Youth Institute festival I was able to meet not only the graffiti writers employed by the institute, a mix of older and newer generations of writers, but also the break dancers, criminologists, rappers, and organizers who all work side by side. Most of the writers working at the Institute are different than those who were there from 2009 to 2015 (save for Chuen and Kart). The current administration is supporting a kind of resurgence of urban art, of a (nearly) comparable intensity as that of the first major period of sponsorship from 2009-2012 [2/3]. Since I have arrived two major urban art projects have been completed and inaugurated. The first, a massive mural on Boulevard López Mateos where it intersects 5 de Mayo Street. This mural offers an image of different cultures of the world, that “we are all human and diverse” Onza remarked, and the universal process of aging, showing from left to right a child to an old man. The second project is a set of four massive murals on large apartment buildings where the Malecón del Rio meets Valtierra avenue on Conjunto Habitacional “El Duraznal”. These murals are portraits of famous Mexican writers, including Octavio Paz, Carlos Fuentes, Juan Rulfo, and Rosario Castellanos. The faces of the writers are grey and they are surrounded by color. “This is an example of color therapy,” (cromoterápia) Onza explained to me in a personal interview , a comment also repeated by another writer in an article about the mural in El Sol . This month the institute is working on opening up the Malecón del Rio as a legal space . It is over 1000 meters long and plays a comparable role to the LA river as a historic site for writers. This project, among others, raises questions about the shift that has happened from the writer being situated as a “juvenile rebelde” a “rebel youth” to an employee working for, or alongside, the state. If the state is not monolithic, is it appropriate to see the work of these artists as creating more nodes and spaces for creation, “stealing” in the framework of de Certeau from institutions of power to make their lives, and the lives of their compatriots, more livable, a sort of collective ethos? Or is it better read as a kind of cooption, tethering the writer to another popular narrative by the youth institute and for youth, that of the entrepreneur, the savvy neoliberal subject who makes their own destiny? In the former framework, inequality is taken as a baseline condition. In the latter it is made invisible from discourses similar to Rawls’ “original position.” Or perhaps creating more legal spaces and parameters for graffiti allows practitioners to sustain a relationship to their recollection and memory of youth, since, for many, youth is something that is inextricable from graffiti because they discover the art form when they are young, and use it as a way to survive and even thrive during the trials and tribulations during this challenging period in life. The Malecón as a youthful topos. Sometimes empty and dry, sometime surging with water after one of the heavy rains, it is a space that is already animated by inscriptions, legal and illegal, that give testament to the plurality of worlds that inhabit the shared space of León. Mil gracias a: Comexus/Becas Fulbright García Robles; Universidad Iberoamericana León y el programa de Doctorado en Ciencias Sociales, Complejidad e Interdisciplinariedad; León Joven y el Instituto Municipal de Juventud; Mersi; Dafne; Onza; Era the Dog. Héctor Gómez Vargas, Cartografias Urbanas y el Equipmiento Cultural en Leon, León, GTO: Precesbac, Universidad Iberoamericana León, 2001, p. 16. Caitlin Bruce. 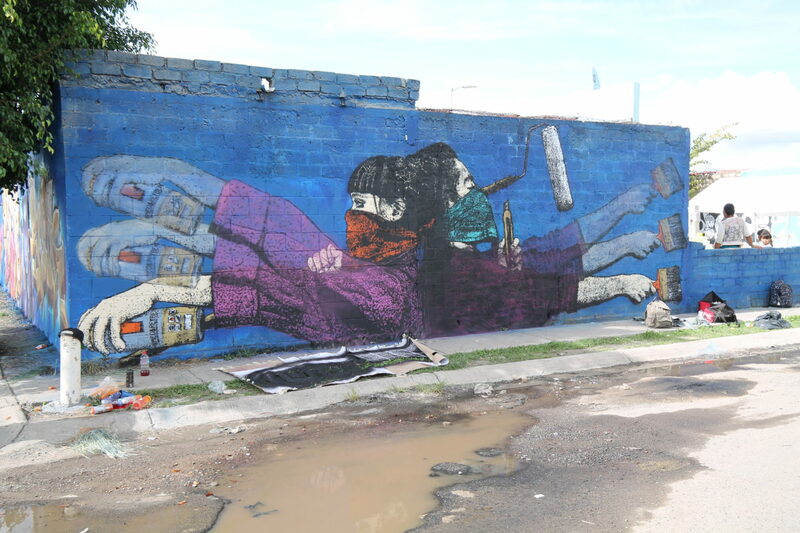 “Modalities of Publicity: Leon’s City of Murals Project” in Inopinatum. The unexpected impertinence of Urban Creativity, edited by Luca Borriello, Christian Ruggiero, Salerno, Italy: ArtiGraficheBoccia, 2013. Interview with Dafne, August 2017. Interview with Onza, August, 2017. Nuevo Valle de Pedro Moreno. Los Gatos Flacos performing. August 13, 2017.